In our house, we don’t usually make a big deal out of Easter. Mostly, it’s just an opportunity to spend a Friday morning sleeping in and an excuse to eat too much chocolate. There are a few holiday traditions I absolutely refuse to live without, though, the most important of which is my annual hot cross bun binge-fest. 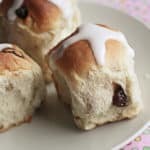 As far as I’m concerned, it’s not Easter until I’ve gobbled up at least a half-dozen of those fruit-studded sweetly spiced buns. This year, I decided to give my annual tradition a decidedly untraditional twist to wrap up my two-post series featuring French’s Dijon mustard. 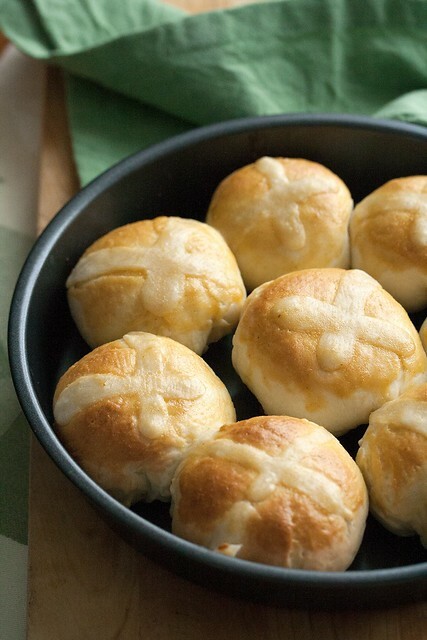 At first glance, they could pass for a typical hot cross bun thanks to their glossy golden-brown crust, but there’s a delicious secret tucked beneath those trademark crosses – a savoury little pocket of bacon-and-green-onion deliciousness neatly tucked in the middle of each bun. Much like my beloved Chinese bakery buns, this recipe begins with a fluffy Asian-style milk dough enriched with cream, butter and egg, and wraps it around a simple filling of crisp-fried bacon, thinly sliced green onion and a generous amount of black pepper. 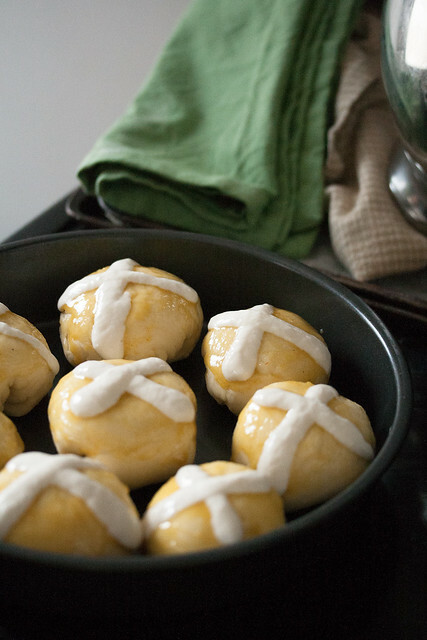 From there, we take a detour into hot-cross bun land by topping off the buns with a flour-and-water paste cross, before coming back to the savoury with a double-dose of French’s Dijon mustard – a little dab added to the filling for a peppery bite, and a more generous dollop blended with honey for a sweet-tangy glaze that gives the buns their glossy sheen and golden-brown colour. I’m not going to lie, these do take a little effort to prepare, but they’re utterly worth it… especially if you’re after a little something special to add to your holiday table. 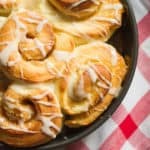 You can make these the centerpiece of a cozy family brunch, or serve them instead of rolls for a full-on Easter dinner with all the trimmings. Either way, they’re sure to be a hit. 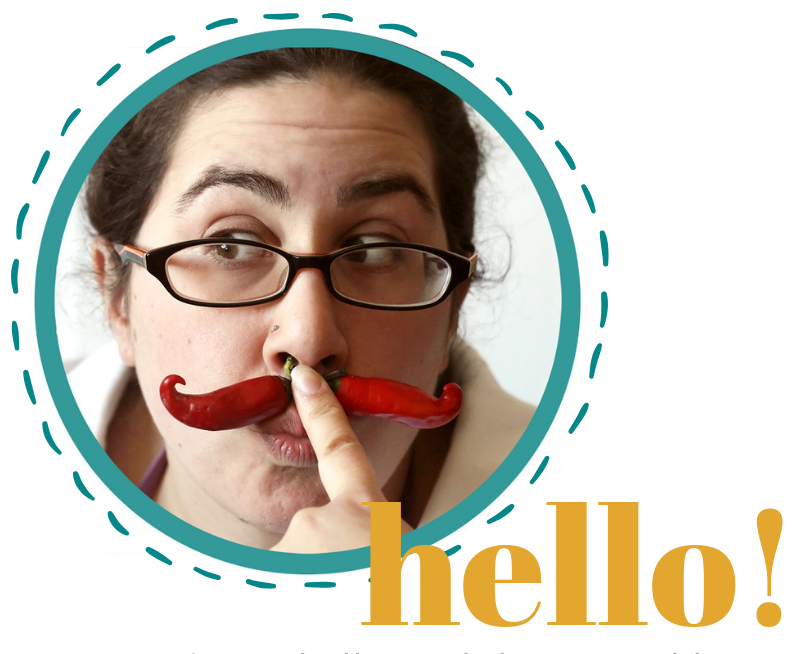 Disclosure: This post was brought to you by the makers of French’s Dijon Mustard. I received compensation to write this post through the French’s Easter Program… all opinions expressed are my own. 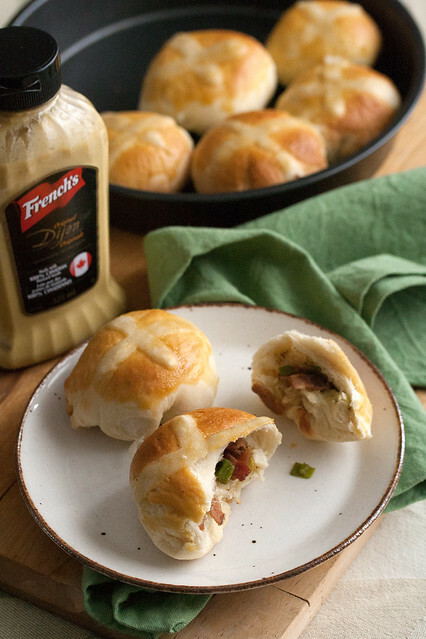 This savoury twist on an Easter classic has a wonderful secret hiding inside its rich, fluffy milk dough... a pocket of bacon and green onion deliciousness! Pour the warm milk into the bowl of a stand mixer and sprinkle with yeast. Let stand for 5 minutes to proof. Once the dough starts to pull together into a ball, increase speed to medium-low and knead for about 10 minutes or until the dough has pulled into a ball and feels soft and elastic. Transfer the dough to a lightly oiled bowl, and cover with a clean dishcloth. Place in a warm, draft-free spot to rise until doubled in size, about 1.5 hours. While the dough is rising, saute the bacon in a large heavy-bottomed skillet until it starts to crisp. Drain off all but 1 tbsp bacon fat. Add the green onions and saute for 2-3 minutes longer, or until the onions are soft but haven’t taken on any colour. Set aside to cool. Once the dough has doubled in size, punch it down and knead 2-3 times. Divide into 16 equally-sized pieces, and roll each one out into a 5” circle. Place a small dollop of mustard onto the middle of the circle using a scant ½ tsp measure, and top with a heaping tablespoonful of the bacon and green onion mixture. 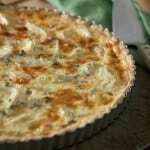 Bring the edges of the dough together to enclose the filling inside a ball, and pinch tightly to seal up the filling. Arrange the buns about 2” apart on two large parchment-lined baking sheets (or arrange in two 9” round non-stick cake pans, if you prefer.) Cover with a clean dishtowel and let rise for 45 minutes. In a small bowl, stir together the mustard and honey until combined. Brush half of the glaze onto the buns, reserving the remainder for later. 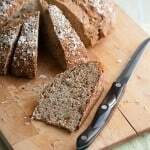 In a second bowl, whisk together the flour and water to make a smooth paste. Scoop into a pastry bag fitted with a round tip, and pipe a paste cross onto the top of each bun. Bake in preheated oven for 25 to 30 minutes, until golden brown. While the buns are still hot from the oven, brush with the remaining glaze. Let cool for 10 minutes, then transfer to a wire rack to finish cooling off completely (or serve right away, if you prefer to serve the buns still-wam. You can also prepare these buns a day ahead. Simply prepare the recipe as per the directions, but once the buns are filled and shaped, cover them tightly with plastic wrap and transfer to the refrigerator to rise overnight. The following day, leave them on the counter to come up to room temperature while the oven preheats, then continue as usual from there. Voila! 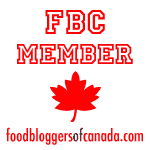 Fillings in a bacon…very interesting, is it possible to do an egg filling? 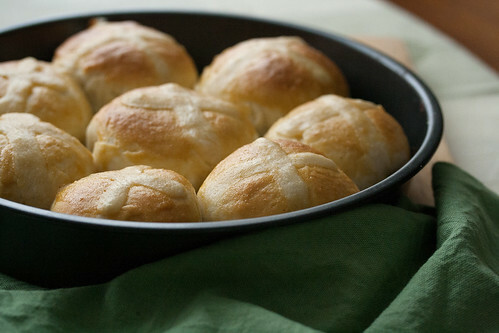 BTW I love the name of your blog,and the very simple design..
savory hot cross buns are THE BEST IDEA!!! looove the green onions and bacon!